Under the idea that you can never, ever have enough opportunities to kick some more dirt on Isiah Thomas — considering what he did to the Knicks, fans should never, ever lay off him — we thought we’d take a quick trip down to Hot Springs, Arkansas, host to the Sun Belt Conference Men’s Basketball Tournament. Sit tight, we’ll make it worth your while. Last night in that tournament, Florida International, a tiny college in Miami, upset Middle Tennessee State in the Sun Belt semifinals, advancing to tonight’s title game against Western Kentucky. We understand you don’t care about the Sun Belt championship game. But it matters. See, three years ago, after the Knicks at last sent him packing — even if you don’t like Mike D’Antoni, you have to thank him and Donnie Walsh for that, at least — Thomas decided to take over as head coach of Florida International for the 2009–10 season. Thomas essentially did the job for free; the idea is that he would take advantage of the Miami recruit pipeline and build FIU into a Sun Belt power, as well as rehabbing his own reputation within the game. The first season, Thomas went 7-25. Well, that’ll happen; it’s difficult to start a program from scratch. Thomas brought in several high-profile big-program transfers (like Illinois’s Alex Legion) and prepared to turn it all around. In 2010–11, Florida International went 11-19, a bad record that was at least a slight improvement. That was the final transition year, with all the fruits of Thomas’s labors set to be reaped the next season. In 2011–12, Florida International went 8-21. After the season, FIU, a tiny school in Florida, fired him. Afterwards, Thomas said: “This is the most surprising thing that has happened to me in basketball.” That can’t possibly be true. 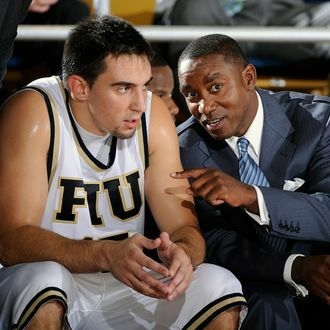 Isiah Thomas went 26-65 in three years at Florida International, who fired him and replaced him with Rick Pitino’s 30-year-old son, who is one game away from the NCAA Tournament. This man ran the Knicks for nearly a decade. We know everyone’s sad about Amar’e Stoudemire’s injury and everything, but never forget how lucky we are those days are finally over.